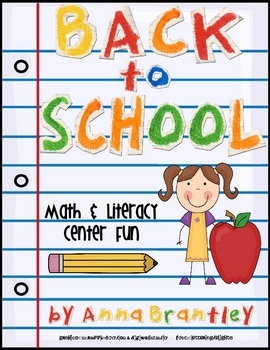 This "Back to School" themed center packet is sure to make learning fun right from the start!!! It includes 10 hands-on centers (5 math & 5 literacy) that your students will love! Check out the center descriptions and downloadable preview for a sneak peek of this 80 page packet! 1.School of Numbers- Students match the 1-10 number digit, number word, and number picture cards. They show the matches they made on their recording sheet. 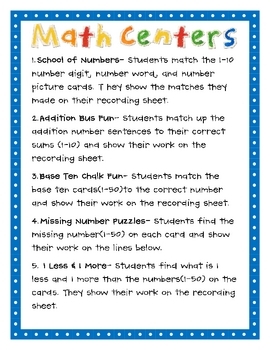 2.Addition Bus Fun- Students match up the addition number sentences to their correct sums (1-10) and show their work on the recording sheet. 3.Base Ten Chalk Fun- Students match the base ten cards(1-50)to the correct number and show their work on the recording sheet. 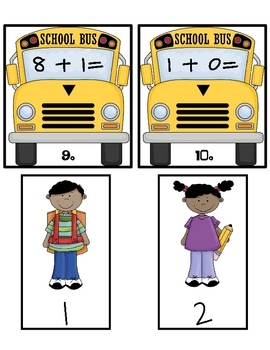 4.Missing Number Puzzles- Students find the missing number(1-50) on each card and show their work on the lines below. 5.1 Less & 1 More- Students find what is 1 less and 1 more than the numbers(1-50) on the cards. They show their work on the recording sheet. 1.Read the Room /sh/ /ch/ /th/- Place the word cards on your classroom walls. Students read each word and sort them by /sh/, /ch/, and /th/ sounds on their recording sheet. 2.Back to School Making Words- Students make as many words as they can with the letters in Back to School. They show their work on the recording sheet. 3.Rhyme Time- Students match the rhyming words and show their work on their recording sheet. 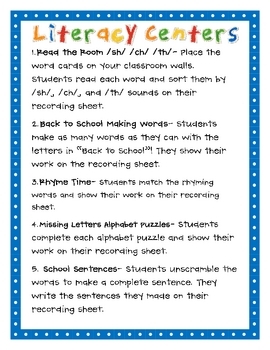 4.Missing Letters Alphabet Puzzles- Students complete each alphabet puzzle and show their work on their recording sheet. 5.School Sentences- Students unscramble the words to make a complete sentence. They write the sentences they made on their recording sheet. Thanks for checking out my store! Please feel free to contact me if you have any questions about my products!